Mark Elliott of Better Photos shares his top tips for photographing waterfalls. Mark Elliott is a Cumbria based portrait and commercial photographer. He also runs Better Photos Photography Training. Set your camera to its lowest ISO setting. To get the water looking silky smooth, use a slow shutter speed (of between 2 and 25 seconds). When in Aperture Priority mode, set your camera to a small aperture e.g. f/16 - f/22 (or smaller). This ensures that you get the slowest shutter speeds possible in any ambient lighting conditions. 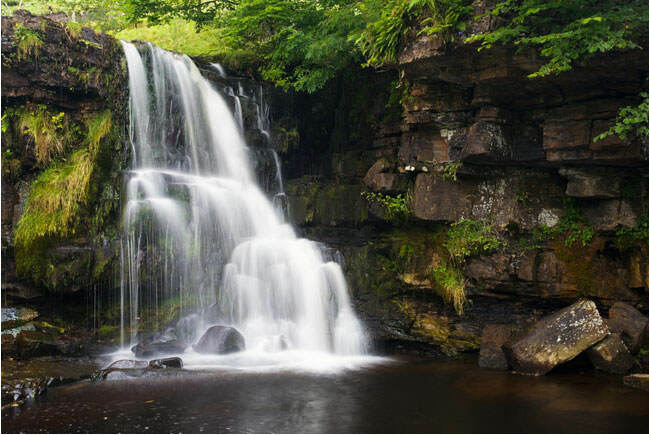 Photograph waterfalls in the low-light of early morning or evening for a slower shutter speed. How slow can you go? Want an even slower shutter speed? Use Neutral Density filters to further reduce the amount of light from entering your lens. Use a polarising filter. It slows down your shutter speed, removes glare and saturates colours. To get a different look - 'freeze' the motion of the water by using a fast shutter speed. When in Aperture Priority mode, set your camera to a wide aperture such as f/2.8 - 4. This ensures that you get the fastest shutter speeds that the ambient lighting conditions allow. At your widest aperture but want an even faster shutter speed? Increase your ISO but beware of adding grain to your images. Check your camera's LCD after taking each photograph to ensure that the water's highlights are not 'blown out' (set your highlight alert warning in your camera menu - and blown out highlights will appear as a blinking warning on your LCD). Reduce your EV (Exposure Compensation) until the 'blinkies' stop. For more interesting compositions, wear wellies so that you can position yourself in or at the waters edge. Take care and don't fall in!